Another Gold Star Pokemon card cracks our Top 25 list. Gold star cards feature an embossed foil star next to the Pokemon’s names. They also feature shiny/alternate color variants of the Pokemon. Some parts of the Pokemon’s artwork usually stick out slightly beyond the art box. Gold Star Pokemon are extremely rare to find when opening a Booster pack … only about 1 in every 72 packs or so. This card sold for $6400 in December 2017. 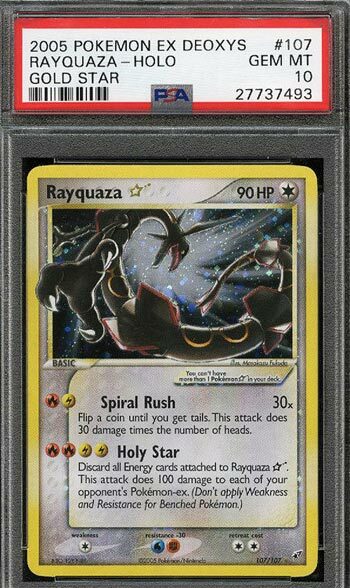 There are 29 of these PSA 10 Rayquaza out there right now according to the POP Report.